I finished stitching the binding on this just in time for our sunny warm weather today! This fabric is so cute, I bought it at the Quilt Expo here in Cleveland a few weeks ago. I love muted primary colors, they are so retro and bright. I couldn’t find anything perfect for the binding, so I went with a pieced scrappy binding. The back is a soft neutral dot. I hope you are getting this nice warm weather like we are…now if you’ll excuse me I have one very eager toddler who wants to go to the park! ps. Have you seen this video yet? It will make your day. it’s gorgeous! now i want to run to the sewing room and whip one up. well almost, i’ll wait until I’m feeling better. 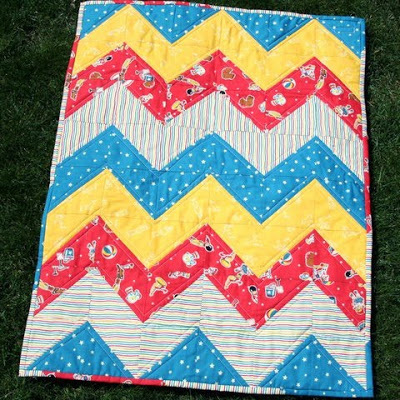 beautiful….I must make a zig-zag quilt soon….I love them! Very cute! I love pieced bindings. Great colors! And I love that you quilted along the zig zag lines too. Makes it look really sharp. Cute quilt. I have been wanting to make one of these too. WOW! The singer is amazing! I love this vintage-looking quilt. Beautiful fabric combinations and very inspiring. As I posted today, I’m FINALLY getting up the courage to begin my first quilt. This is fabulous. 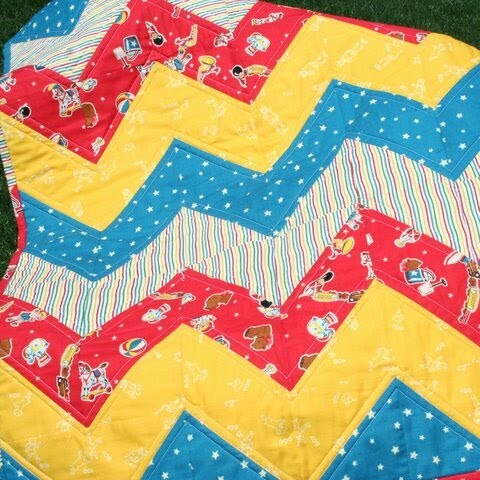 I want to make a zig zag quilt so bad… among others! haha. I love how cheerful it is! That video DID make my day! Thanks for sharing. love the zig zag! terribly cute! This is great! I love that fabric collection. Adorable! 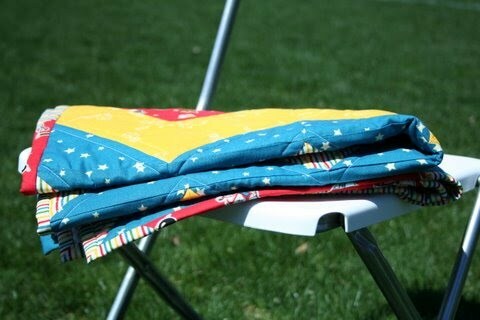 I love the combination of spring colors and the quilting you did just inside the zig and the zag. I have wanted to do a zig zag quilt for so long and now I am inspired more than ever to do one! It looks amazing! What a nice little quilt..I want to try that pattern sometime. I knew as soon as you posted that link what video you were talking about. I just watched it for the first time this morning..pretty amazing. Two lessons to learn from it..Don’t judge a book by it’s cover and never give up on your dreams. Thanks for the link. Susan was wonderful. She seems like such a beautiful person (inside and out). It made me cry. Beautiful! What a FUN, FUN quilt! CUTE summery quilt! I had seen the Susan Boyle video…amazing huh? Very cute quilt! And thank you for sharing that video. It actually made me tear up. I love that the audience was so wrong about the way they were treating her. She showed them! And her voice is incredible. Thanks for sharing that! love this one. i love primary colors too. especially this time of year. so pretty. Oh, I need to get busy and use that fabric! love what you did! What collection of fabric is that? It’s adorable!